Hair pins with flower for a cocktail, kanzashi for a bride boho hair accessories wedding, ceremony, women gift metal pins. Green version: Bobby pins made with the Green vialaton and large translucent beads for the heart. The diameter is 5 cm by flower. For the Red version, the PIN is made with a red cotton cord. The diameter is 11/2 cm. Inspired art nouveau, geometric design, this headpiece is an alternative to the hat that will not go unnoticed. White version: floral interpretation, these hair accessories are made of tubular nylon flowers fabric and Pearl imitation diamond. The work is on long 7 cm color Bobby pins gold and the diameter is 7 cm for the larger flower for the smallest 6 cm. 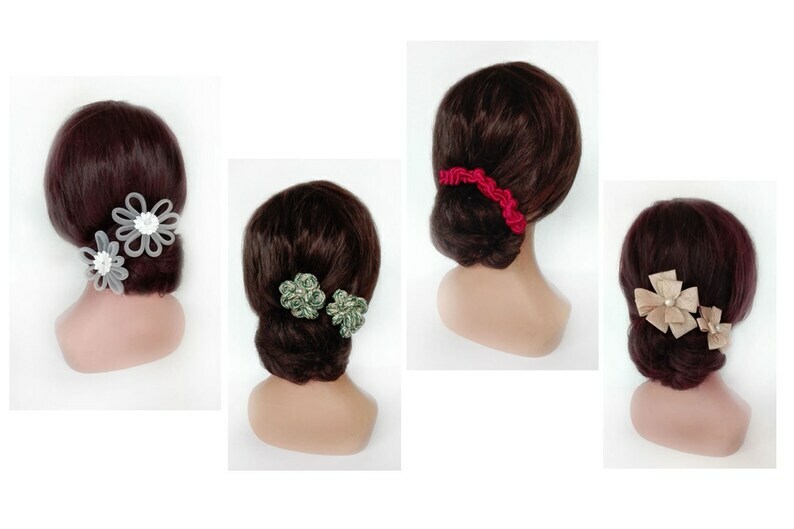 Hair accessory to liven up any hairstyles, wedding or any other occasion. Beige version: made flowers in Lese natural Pearl ivory, mounted on 2 hair pins. Flowers diameter is 7 cm for the biggest and 5.5 cm for the little one. Minimalist kanzashis revisited, Bobby pins needles hair that will beautify your wedding hairstyle with directing your hairdresser.